Sheffield Wednesday football club is a high traffic venue with thousands of people coming through the stadium each week. This means that there is a high demand for washroom facilities and a need for them to be of a high standard and cost-effective. Sheffield Wednesday’s previous supplier for disposable paper toilet tissue and hand towels required an annual outgoing price of £20,000, so the club was keen to reduce costs wherever possible, whilst improving quality and service. As a result of poor dispensary systems, the cleaners had to frequently attend to the unreliable dispensers and constantly replenish them. 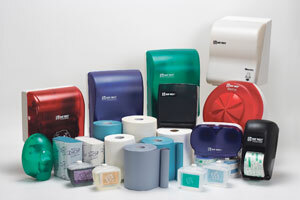 Disposables UK chose Bay West Revolution™ and Bay West Optiserv™ Hands-Free systems for the clubs’ washrooms due to their cost-saving and waste-reduction qualities. After a referral from Scunthorpe United, through Disposables UK’s partnership with the Football Safety Officers Association (FSOA), Sheffield Wednesday selected Bay West on the strength of the quality of the products. The range was selected due to the multiple benefits it offers, including waste reduction, high capacity and cost-savings. Sheffield Wednesday Football Club is already benefiting from the savings associated with installing the Bay West range and is now saving around £10,000 each year. Disposables UK were even able to provide all the products in Sheffield Wednesday’s team colours, blue and white. After trialling the Bay West products for three months in the busy washroom area in the West Stand, the club was delighted with the cost-savings and waste reduction and the range is now fully installed in the guest toilets, staff toilets and all corporate areas. The products are now also used in all the facilities at the Club’s training ground.